The winners of the British GT rounds 4 and 5 held at Snetterton Circuit are Barwell Motorsport’s car no. 33 and TF Sport’s car no. 1. Phil Keen and Jon Minshaw in Barwell Motorsport’s #33 Lamborghini scored a third win of the season after a thrilling battle with MacMillan AMR’s James Littlejohn and Jack Mitchell in #24 Aston Martin Vantage. The #24 Aston Martin started from pole position and led most of the race. In the second half of the race Littlejohn struggled to keep Keen off, and with nine minutes to go Keen finally managed to overtake him and take the lead. Soon after, Sam Tordoff, who shares the seat in #6 Lamborghini with Liam Griffin, also overtook the #24 car and completed a 1-2 finish for Barwell Motorsport in the first race of the day. In the GT4 class, the HHC Motorsport’s #55 Ginetta G55 of William Tregurtha and Stuart Middleton won the race finishing 1.4s ahead of Alex Reed and David Pittard in Lanan Racing’s #51 Ginetta. The 3rd place in the Race 1 was won by Sandy Mitchell and Ciaran Haggerty in the Garage 59’s McLaren 570S GT4. Phil Keen in the #33 Lamborghini started from pole position in the second race of the day and was followed by the reigning Jonny Adam in the TF Sport’s #1 Aston Martin Vantage, while Sam Tordoff was 3rd at the moment. James Littlejohn spun on the opening lap and dropped to the back of the grid. The top 3 went in the pit at the same time when unlucky Derek Johnston, who replaced Adam in the #1 car, was prevented from starting because of the belt issue. However, he returned to the track behind Jon Minshaw but in front of Liam Griffin. With 10 minutes remaining, Minshaw has received a drive-through penalty for a short pit stop, so the Barwell Motorsport missed an opportunity to score a double victory at Snetterton. He dropped to the 6th position and stayed there until the end of the race. Johnston and Adam won the first time in 2017, Griffin and Tordoff were 2nd while other TF Sport’s car #11 of Jon Barnes and Mark Farmer completed the podium. The winners of the second race in the GT4 class are Sandy Mitchell and Ciaran Haggerty, Reed and Pittard again were second, while the 3rd place this time went to Joe Osborn and David Pattison in Tolman Motorsport’s #56 McLaren 570S. 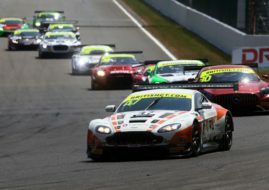 British GT continues on 11th of June with a 3-hour race at Silverstone.